It should of course go without saying that the hard work, talent and therefore the accolades are all theirs – we have seen Bailey heaving all sorts of wonderful gadgetry across the market site at ungodly hours of a Saturday morning, heard tales of Jules’ epic cross city missions to track down avocados of exactly the right ripeitude (it’s a word) and borne witness to the way they have honed their recipes, developed their brand and engaged with their customers in a way that any fledgling business would be proud of. But there is just a little part that we, the Market, are proud of and, without stealing their thunder, we’d like to tell you why ¡Arepa!¡Arepa!¡Arepa! means so much to us at the market. I wrote in my post about why we do this shizzle a few weeks ago about how much we believe in the power of markets to act as incubators for fledgling businesses and how as a social enterprise our very raison d’etre (ooh la la!) is to encourage people in Levenshulme to take their skills from their living rooms and kitchens out onto the streets (and eventually the high streets) but, if I’m honest, right up until we got that email it was a theory. A lovely theory that was backed up by some serious thought and research but a theory that hadn’t really be proven. Do I think that Bailey and Jules would eventually have started their business on a different market or street food platform if we hadn’t existed? Definitely – they’re hard working, talented and driven, I doubt many things could hold them back – but it wouldn’t have been in the place that they live, it wouldn’t be feeding our local economy, they wouldn’t’ve been as able to stay tied to Levenshulme as their “origins”, they wouldn’t’ve bought so many customers into Levy with their lovely food and I wouldn’t get the many emails I now get every week who from other residents who have seen what has happened at the Market and want to use it take their home businesses onto the streets. I don’t know if ¡Arepa!¡Arepa!¡Arepa! will eventually take space on Levenshulme high street and prove our model right through to completion – they may not even have ambitions to do that (knowing them as I now do I suspect they’re more likely to take some kind of residency in a place that seems utterly bizarre in principle but just kind of…works perfectly in application) – but I do know that they were the first to take the leap into the Market in the way that we hoped people would and, in taking a punt on us, they bolstered our confidence that what we were doing was the right thing. Every success they’ve had since then (and they are many!) has the same effect and we honestly could not be prouder. Obviously, after this massive love fest you will be wanting to actually get your hands on some of this theory-proving food and we’re really pleased to say that they will be at the market slinging arepas left right and centre this Saturday, on our food and drink night market on Friday 20th June AND at the the British Street Food Awards regional heats with Guerrilla Eats on the evening of Saturday 14th June – make sure you get down there and cast your vote for our success story their fantastic food. 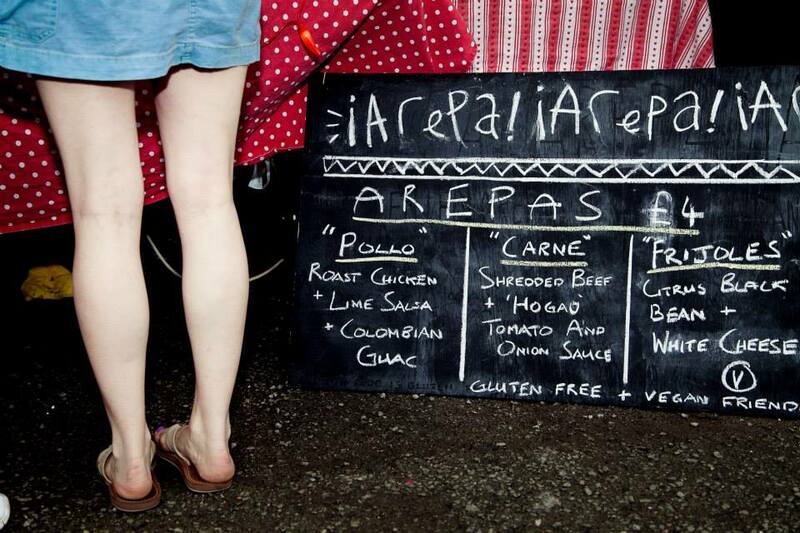 NOTE: It does strike me that I’ve not actually waxed lyrical about the food ¡Arepa!¡Arepa!¡Arepa! serve, which is a bit remiss but I’m no food writer – plenty of people who know how to write about such things have though – check out some great reviews from Bacon on the Beech, Food Geek and Things to Do in Manchester.